(Reuters) - U.S. stocks ended higher on Monday, rebounding from losses late last week with help from Apple and financial shares, but a drop in biotech shares limited the advance. Shares of biotech companies fell after U.S. Democratic presidential candidate Hillary Clinton said she would announce a plan to stop "price gouging" for specialty drugs. Biogen (BIIB.O) fell 5.6 percent to $297.16 and Gilead (GILD.O) was down 2.5 percent at $105.74. The S&P healthcare sector (.SPXGC) fell 1.4 percent and was the only S&P 500 sector index to end lower. The Nasdaq biotech index (.NBI) slumped 4.4 percent. Financial shares bounced back after losing ground following Thursday's Federal Reserve decision to keep rates unchanged. The S&P financial index (.SPSY) was up 1.1 percent. But trading was volatile, continuing the recent trend, with both the S&P 500 and Nasdaq in negative territory earlier. "We had a rebound from Friday's selling... though there still is among investors a high level of uncertainty as to what the Fed statement meant," said Bucky Hellwig, senior vice president at BB&T Wealth Management in Birmingham, Alabama. "That kind of hinders investors from grabbing the ball and running with it." The Dow Jones industrial average (.DJI) rose 125.61 points, or 0.77 percent, to 16,510.19, the S&P 500 (.SPX) gained 8.94 points, or 0.46 percent, to 1,966.97 and the Nasdaq Composite (.IXIC) added 1.73 points, or 0.04 percent, to 4,828.96. 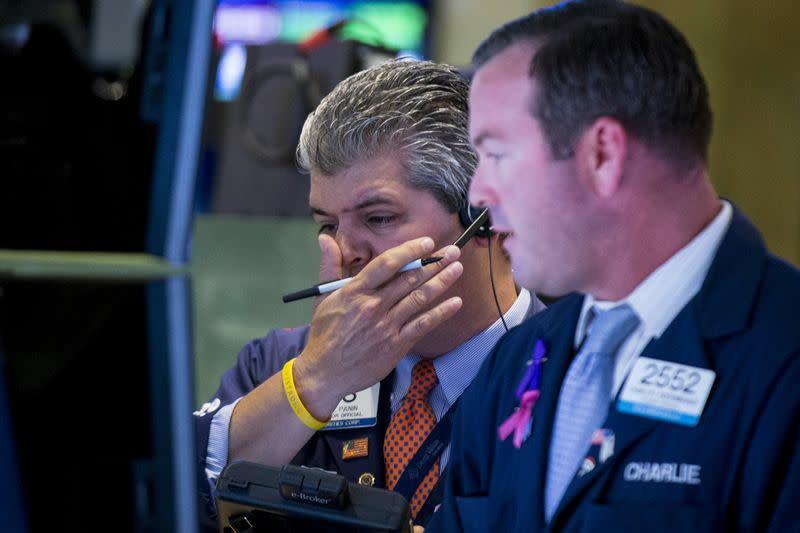 Fears of slowing growth in China sparked a sharp selloff in global stock markets in recent weeks and the Fed's comments about the global economy exacerbated those concerns. Investors are now focusing on the next Fed meeting on Oct. 27-28, though some economists now wonder whether the Fed will raise rates at all this year. Apple (AAPL.O) was up 1.6 percent at $115.21, leading the S&P 500 higher. The Wall Street Journal reported Apple has designated building an electric car as a "committed project" and has set a target shipping date for 2019. Chipmaker Atmel (ATML.O) jumped 12.7 percent to $8.19 a day after Dialog Semiconductor (DLGS.DE) agreed to buy the company for about $4.6 billion. Shares of GoPro (GPRO.O) were down 8.2 percent at $32.27 after Barron's said the video camera maker's shares could plunge to $25 as its latest product launch underwhelmed customers amid increasing competition. Advancing issues outnumbered declining ones on the NYSE by 1,827 to 1,216, for a 1.50-to-1 ratio; on the Nasdaq, 1,492 issues fell and 1,308 advanced for a 1.14-to-1 ratio favoring decliners. The S&P 500 posted three new 52-week highs and 18 lows; the Nasdaq recorded 36 new highs and 68 lows. About 6.5 billion shares changed hands on U.S. exchanges, below the 8.3 billion daily average for the past 20 trading days, according to Thomson Reuters data.